'One reason for this is Shah's talent. He is a terrific organiser and builds his strategies around the grassroots worker,' says Aakar Patel. In September 2009, Amit Shah was driving over to sign the forms to become president of the Gujarat Cricket Association. With him in the car was Chief Minister Narendra Modi. As they approached, the story goes, Modi changed his mind and said to Shah: "Nahin yaar, hoonj banu (I think I will take this post)." Modi became the GCA president at the last moment and Shah, ever loyal, had no problem with this. The Congress has no such person as Shah. He is loyal and efficient, and Modi trusts him enough to give him independent charge of the party. Shah is a clear number 2 in the Bharatiya Janata Party politically. 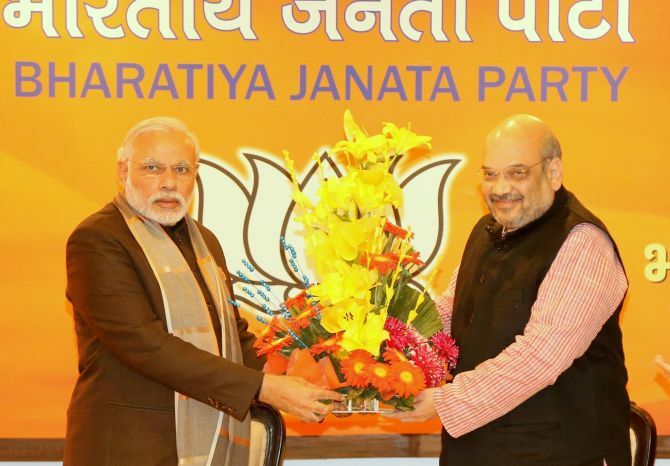 On January 24, Shah was elected again to the post of BJP president and will hold charge for three years. Shah will head the party as many important states go into elections in this period, including Uttar Pradesh, West Bengal, Punjab, Assam, Kerala and Tamil Nadu. In many of these states, the BJP is trying to grow and, as the Dalit leader Kanshi Ram once observed, elections are the only time when a party can be grown and expanded. My feeling is that 2016 will be a good year for Shah and the BJP electorally. It was felt in the media that 2015 was not such a good year for the BJP. It was brushed aside by the Aam Aadmi Party in Delhi and lost by an unexpectedly large margin against the Janata Dal-United and Rashtriya Janata Dal in Bihar. But if this has affected Shah's confidence he has not shown it, and rightly. He has kept the BJP vote banks intact in both states. He was defeated in Delhi only by the phenomenon of Arvind Kejriwal (along with Modi the sharpest politician of our time) and it took the coming together of all the other parties in Bihar to keep Shah out. Even in Gujarat, where the Congress was expected to do well given the rebellion of the Patidar community over reservations, the BJP kept every single major city in what is India's most urbanised state. In the medium term, the advantage is still with the BJP. One reason for this is Shah's talent. He is a terrific organiser and builds his strategies around the grassroots worker. It was said of the Barack Obama Democratic nomination campaign of 2008 that it succeeded because of his 'ground game'. This refers to logistics and operations instead of the genius of the candidate. It is about hard work and planning. Shah is very good at this sort of thing. He is a Jain from a business background. Overweight and prosperous looking, Shah is a Hindutvawadi of the middle class Gujarati type and unlike Modi, he is not a pracharak type figure of the Rashtriya Swayamsevak Sangh. However, he is focussed and dedicated as any other RSS man and his business background gives him the advantage of seeing things with clarity and with pragmatism. It was announced after his election as party president that for a year-and-a-half after taking over, he had averaged around 500 km a day as he travelled across India building and strengthening the party. It is difficult to imagine anyone in the Congress doing this sort of thing of their own initiative. But Shah is constantly at it. I was in Ahmedabad a few months ago and noticed a big campaign aimed at building the BJP's membership there, gathering a database through missed calls, even though the Congress has no chance of winning there. When I was working in Ahmedabad 11 years or so ago, I had the chance to interact with Shah. He was a gruff character with a distrust of the media. The only journalist who has regularly been allowed to interview him so far as I know is Sheela Bhatt, ex-Rediff and now with the Indian Express, and her combative but patient interviews with him are illuminating. I suspect one reason he allows her to interview him because she speaks in Gujarati, the language he is most comfortable with. With Shah firmly in charge, Modi is assured that he can shape and roll out his electoral strategy without much electoral interference from dissidents like L K Advani. Their partnership is effective and meaningful, and, unlike the Advani-Vajpayee one, there is total clarity on who is Number 1. It will be fascinating to see how Shah approaches the big elections of 2016 in order to win Modi a Rajya Sabha majority. I started by recounting the story of the Gujarat Cricket Association, and I will conclude with it. In 2014, five years after that day in the car, Modi became prime minister and resigned his post in the GCA. Its new president? Amit Shah. IMAGE: Prime Minister Narendra Modi greets Amit Shah on his re-election as BJP president. Photograph: Kind courtesy BJP's Facebook page. Exclusive interview with Amit Shah!